Street Food: Marquesitas. ¡Qué ricas! There is one thing you need to know about me before reading this (not objective at all) post: I love pancakes. In all of their forms: sweet, savoury, with fruit, with or without baking powder, in all shapes and forms. I just love them. This is why when I saw something that looked like a pancake cart in a park in Valladolid, I quickly walked, or better, I slowly ran toward it. I was right: they were making Yucatan pancakes! 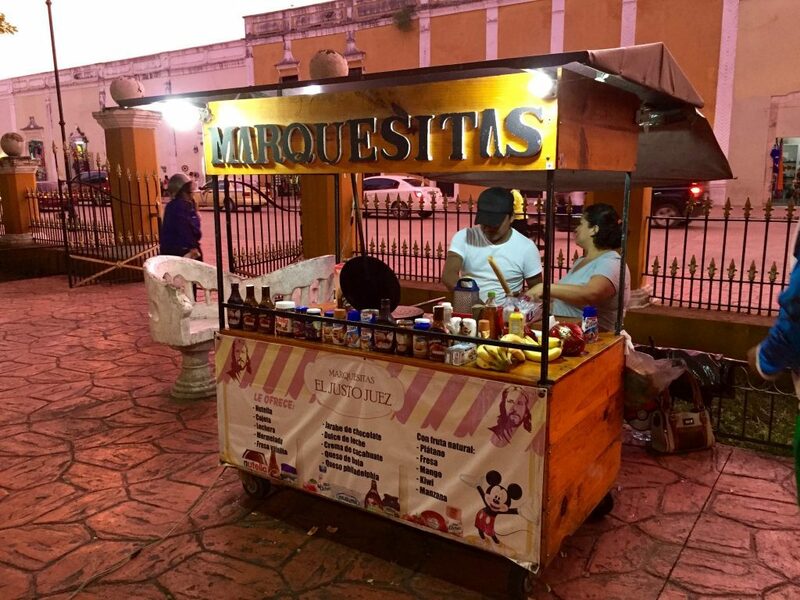 Marquesita is a typical Yucatan street food. It was an ice cream vendor Don Vicente Mena from Mérida who came up with them in the winter of 1938, when his ice cream sales were down. He called them marquesitas after the daughters of a wealthy marquis who loved the delicious treat so much. The batter is the same as for a pancake (flower, eggs, milk and salt), which they pour into a round waffle iron. They make them very thin and because the temperature is really high, the batter turns crispy. After they’re done, they sprinkle Dutch cheese on it! Typically it’s edam cheese, which the Dutch brought to the Yucatan peninsula some centuries ago and apparently the Mexicans loved it so much, they now put it in their traditional street food. Who could blame them, right? You can have a marquesita only with cheese, but then you’re not doing it completely right. You need to add a sweet topping of your choice too; usually nutella, peanut butter, dulce de leche, chocolate sauce … depends on what your marquesita maker is offering. When the crispy pancake is rolled, the heat melts the cheese and sweet and savoury tastes add up to a deliiiicious mix. My favourite taste: cheese and dulce de leche. Heaven! 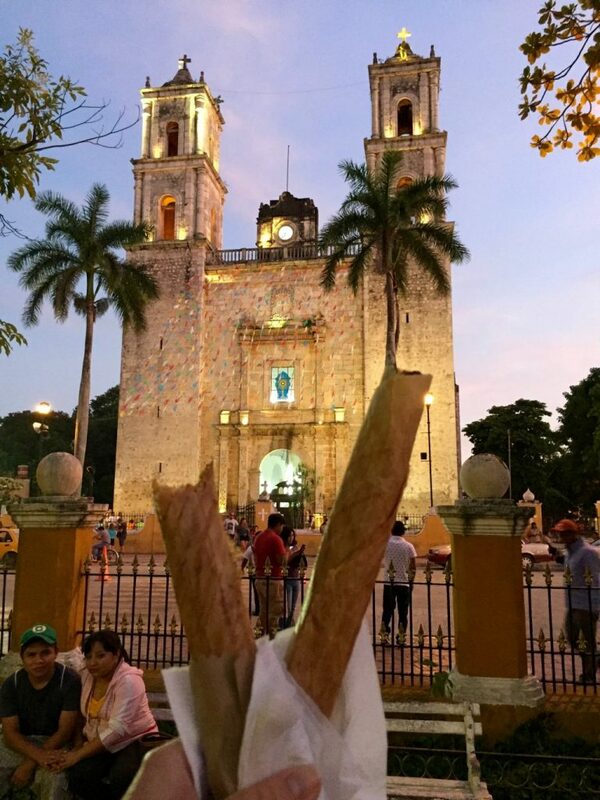 Two crispy pancakes – marquesitas in front of a church in Valladolid, Yucatan. One was with cheese and nutella and the other one with cheese and dulce de leche.